Central Board of Indirect Taxes and Customs (CBIC) has notified the rate of exchange of one unit of foreign currency equivalent to Indian rupees relating to imported and export goods, in its notification no. 96/2018 - Customs (N.T.) dated 6th December, 2018 (w.e.f. 7th December, 2018). In exercise of the powers conferred by section 14 of the Customs Act, 1962 (52 of 1962), and in supersession of the notification of the Central Board of Indirect Taxes and Customs No.93/2018-CUSTOMS (N.T. 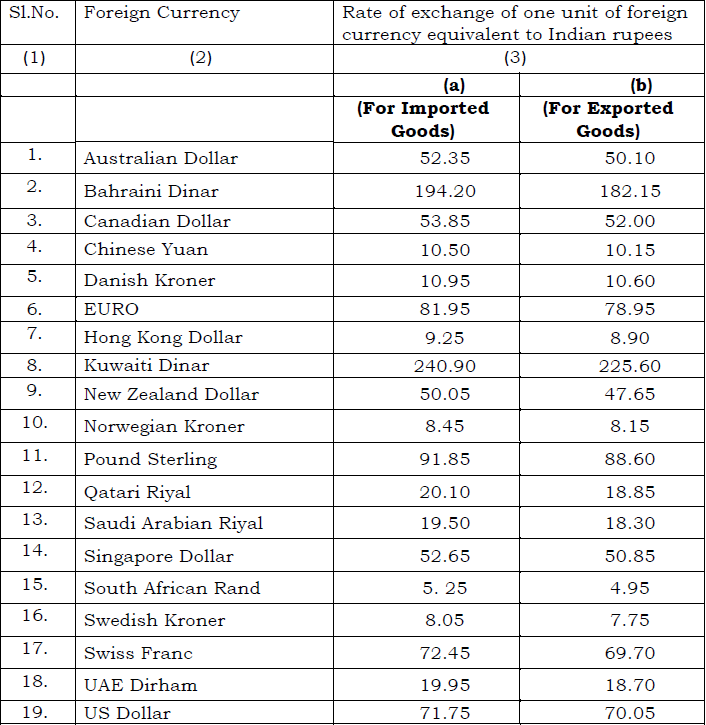 ), dated 15th November, 2018 except as respects things done or omitted to be done before such supersession, the Central Board of Indirect Taxes and Customs hereby determines that the rate of exchange of conversion of each of the foreign currencies specified in column (2) of each of Schedule I and Schedule II annexed hereto, into Indian currency or vice versa, shall, with effect from 7th December, 2018, be the rate mentioned against it in the corresponding entry in column (3) thereof, for the purpose of the said section, relating to imported and export goods.